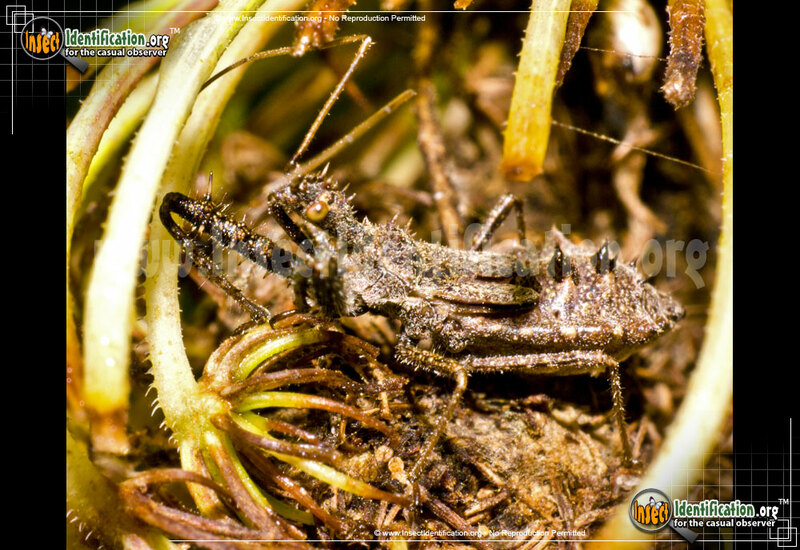 Detailing the physical features, habits, territorial reach and other identifying qualities of the Spined Assassin Bug. A traveling hunter, the prickly Spined Assassin Bug looks just as ferocious as its method for dispatching prey. Spined Assassin Bugs are covered in pointy spines or spikes. The purpose of them may be to fend off predators. The ones on the front legs and the head may aid in subduing larger prey. These little spikes all over the body give the Spined Assassin bug a formidable appearance. This insect hides in plant foliage or on flowers, waiting for an insect to pass by it. The strong front legs grab the prey and a long fang at the mouth repeatedly stabs the insect to death with rapid piercing movements. If handled carelessly, this fang can prick human skin creating a mighty painful wound. Look for this brown Spined Assassin Bugs on flowers in meadows, gardens, and flower beds. Turn over leaves carefully as they may be under them, hiding. Check inside blossoms, too.